The Shipping Ministry on Monday said it has set a target of awarding 30 projects, entailing Rs 24,633 crore investment, for the current fiscal to add 288.48 million tonne capacity. "The achievement of the Ministry during 2012-13...has been outstanding... This is the best performance for any year in the history of Major Ports... We have finalised the Action Plan for this year (2013-14) and a target of 30 Port Development Projects has been fixed," Shipping Minister G K Vasan told a Parliamentary Consultative Committee in Mumbai. A statement from the Shipping Ministry quoted Vasan as saying: "I am confident that the targets for the current year will be achieved by all the Major Ports." The ministry awarded 32 Projects last fiscal that will add a capacity of 136.75 million tonne per annum, costing Rs 6,765.63 crore. It has also decided to establish two new Major Ports, one at Sagar Island in West Bengal and another in Andhra Pradesh to add a capacity of 100 MTPA, the Minister said. 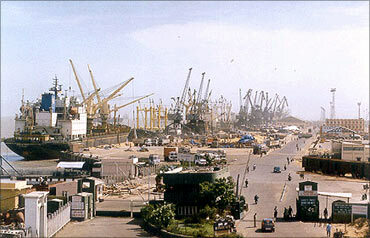 India has 12 major ports: Mumbai, Jawaharlal Nehru Port Trust (Navi Mumbai), Kolkata, Chennai, Visakhapatanam, Cochin, Paradip, New Mangalore, Mormugao (Goa), Ennore, Tuticorin and Kandla under the control of the Centre. Vasan said ports are the gateways for export-import trade and any deficiency will affect the country’s trade as well as the competitiveness of its industries. The 12 major ports handle 58 per cent of the total traffic in the ports while non-major Ports handle 42 per cent. Detailing the steps to boost investment in port projects, Vasan said the government has permitted 100 per cent FDI under the automatic route; allowed income tax incentives as per Income Tax Act, 1961; standardised bidding documents besides enhancing delegation of financial powers to Shipping Ministry and streamlining security clearance procedures. He also added that the Maritime Agenda aims to create port capacity of 3,200 MTPA by 2020, which is more than 3-fold increase over 10 years, for handling about 2,500 MTPA of projected traffic at an estimated investment of about Rs 3 lakh crore. The capacity of Indian ports stands at a little over 1,000 MTPA.